There are more online betting sites out there than you can shake a proverbial stick at, and pretty much all of them let you bet on football. But that doesn’t mean that they’re all as good as each other – some are fantastic, offering great odds, competitive promotions and useful features, whilst others are simply not worth your time (or your hard earned money). 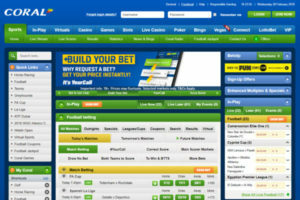 In the list below you’ll find reviews of who we think are the best betting sites for football betting. We’ve written short and to-the-point summaries of each of the bookies so that you can quickly compare them, but each bookmaker also has a longer, more in depth review which you can read by clicking the relevant title. One of a clutch of companies who made a very successful transition from high street bookmaker to online gambling giant, Coral – who are an integral part of the Gala Coral Group – have been going since the 1920s and have adapted with the times. Now a highly polished betting company who offer various gaming products aside from their sportsbook, Coral have a well-earned reputation for offering very good betting odds and some excellent offers and promotions, especially for football and horse racing betting fans. Football betting fans in particular have lots to get their teeth into with Coral. Their Football Jackpot, which was launched in 2013, gives punters the chance to win massive prizes (at least £100,000 each week and regularly more than £1m) from a £1 bet, while they have a host of ongoing and match/event-specific football betting offers. With very well developed live betting and mobile betting options, an efficient and effective customer service provision and a solid reputation for being fair, Coral are one of the best in the business without a doubt. As with some other bookies we feature, Betfred have been able to expand from being a high street bookmaker to a highly successful online gambling company who offers a range of products including poker, casino, bingo and, of course, their top notch sportsbook. Having started life back in 1967 as a single betting shop in Salford, Betfred’s rise was strong but steady for decades before the internet allowed them to really take off. They are now renowned as one of the best bookies in the world thanks to their very competitive betting odds – especially on football and horse racing – and their fantastic range of ongoing betting offers and bonuses. Owner and founder Fred Done dubs himself the “Bonus King” and he certainly lives up to that name with some potentially very lucrative promotions such as their ongoing Double Delight, Hat-trick Heaven and 1-A-Piece offers which give football betting fans something to cheer. With an intuitive and simple mobile interface that keeps betting on the go an efficient and fun process, and a massive range of sports betting markets, check Betfred out today, if you haven’t already, and see what makes a brilliant betting site. Formerly known as Victor Chandler (after the founder), then VC Bet, BetVictor have a long history that stretches back to the 1920s and they have managed to maintain the same values of fairness and excellent odds that helped them grow in the 20th century and combined them with technological advancements and innovation in the last 20 years to make them one of the biggest and best gambling companies on the planet. Whilst BetVictor cover as wide a range of sports as almost all their rivals, they are particularly strong when it comes to football betting and – especially on the Premier League and other popular leagues and competitions – they regularly offer the best odds in a range of markets. Happy to take a position when other bookies follow the herd, BetVictor regularly stand out and even compete with the exchanges on occasion. When it comes to football betting offers, BetVictor also score very well, their regular match or event-specific promos giving punters ample opportunity for refunds of losing bets (such as their regular Red Card Refund offer) or enhanced odds. With a slick mobile slick and a strong reputation for fairness, BetVictor are a safe, secure and generous bookie with whom to bet. Ladbrokes – like some others we feature – made their name on the UK high street before launching into online gambling, and they have become a massive global company that employs over 15,000 staff worldwide and offers every type of gambling product you could wish for, from bingo to casinos, poker to skill games. But it is their sportsbook which is most impressive in our eyes. 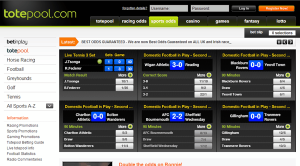 They offer one of the most extensive football betting experiences around with more than 120 betting markets on big football matches (Premier League and various televised games) and their odds are very competitive, especially for some of the increasingly popular markets such as “both teams to score” and “under/over 2.5 goals”. Having purchased betting exchange Betdaq in 2013, Ladbrokes now offer both a fixed odds sportsbook and a betting exchange, giving punters the option to lay other people’s bets as well as placing their own. 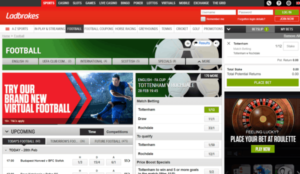 A massive gambling company with a solid reputation and a fantastic range of betting products, Ladbrokes really are one of the giants of the gambling world with a betting site that is hard to fault. 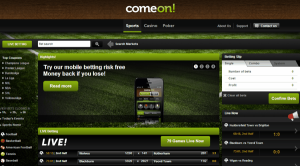 ComeOn may not have been around as long as some of those featured here (they went live in 2010), but they have come a long way in a short time and their innovative, no-nonsense way of doing things is proving very popular with punters. While some customers will be disappointed with the lack of horse racing betting options, football betting fans are very well catered for with very competitive odds (especially for the Premier League, the Champions League and big international matches), and the range of markets is also extensive. A nice, uncluttered mobile interface makes betting on the go a frustration-free activity and their live betting option is well developed. All in all ComeOn have come on very well in the short time they have been around and we expect them to develop further in the coming years. So check them out and see what you think. Betfair are the market-leading betting exchange and facilitate an astounding number of betting transactions everyday – more than all of Europe’s stock exchanges combined. 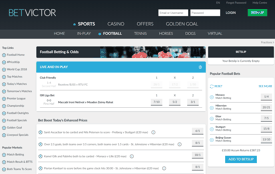 In recent years, Betfair have also added a fixed odds sportsbook which gives punters access to many markets and sports that sometimes don’t have great liquidity in the main betting exchange, not to mention a steady stream of great betting offers. Betfair launched way back in 1999 and grew quickly as punters enjoyed the chance to both place and lay bets with one another, often finding much better odds than those available with conventional bookies. While Betfair’s exchange doesn’t offer as competitive commission rates as some of its rivals, its popularity means the liquidity is generally excellent, often even on fairly obscure markets or sports. For football betting the exchange can offers truly exceptional odds compared to fixed odds bookies, and with a variety of great betting options on their fixed odds sportsbook – including their cash-out feature which allows you to take profits (or cut losses) early on multiples – they basically have all bases covered. 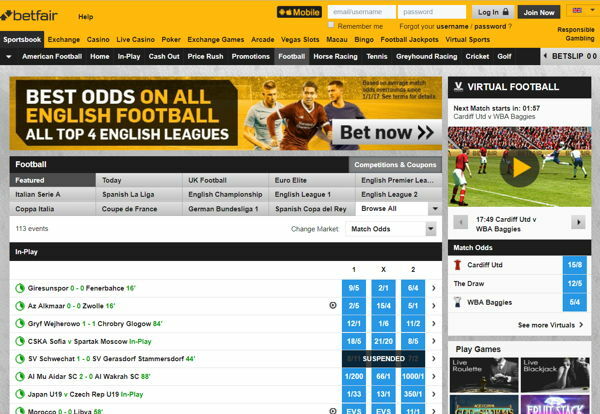 With a very good mobile site, outstanding in-play betting options and excellent customer service, it is not surprising Betfair have become one of the biggest success stories in gambling in recent years. Totesport’s origins go way back to 1928 when they were effectively established by none other than Winston Churchill (yes, that one!). They were owned by the UK government until 2011 when they were purchased by Betfred, and though the sale hasn’t changed too much in terms of the products Totesport offers, we expect a gradual improvement in the not too distant future. That is not to say Totesport were not already a very good bookmaker; they were – and are – a solid bookie who are exceptionally strong when it comes to horse racing and greyhound betting and have made good strides in relation to football betting in the last decade or so. They are not quite as polished as some we feature here, but they are improving and – no doubt due to influence from their parent company – they have started to increase the regularity and generosity of their betting offers and have seemingly edged up their football odds on some of the bigger matches. For football betting fans who also like a flutter on the nags, Totesport is the perfect bookie, and we think they will continue to get better and better as time goes by so take a look and see what you think.